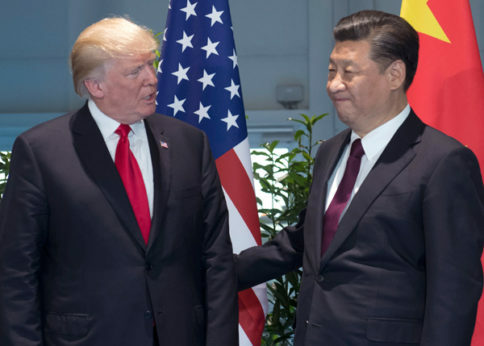 BEIJING—The Trump administration’s declaration of a trade war with China has implications for that country’s latest round of ambitious economic reforms as well as for global economic development generally. China refuses to be bullied by Trump’s imposition of $34 billion in tariffs and the threat to impose $500 billion more. China has swiftly retaliated with its own $34 billion in tariffs on U.S. goods. The purpose of tariffs is not chiefly to overcome the trade imbalance between the two countries and protect American workers. Trump’s real goal, besides energizing his base for the 2018 elections and splitting the ranks of the U.S. labor movement, is to thwart China from becoming a direct economic rival and make it abandon its socialist-oriented economic strategy. This flows from Trump’s new national security strategy, which declared China and Russia strategic economic and military rivals. Until now, China has competed with other developing countries to produce consumer goods for advanced industrialized economies. In the future, it will be competing more directly with the U.S. and other advanced capitalist economies in the advanced manufacturing and technological sectors. Trump wants China to dismantle its “Made in China 2025” strategy, a 10-year plan to make the country a world leader in key scientific and technical fields and advanced manufacturing, with an aim to sharply increase productivity (which is approximately one-third that of the U.S. economy). Trump is demanding China abandon public sector investments in basic science, research, and innovation as well as its targets to raise the domestic content of its manufactured components to 40 percent by 2020 and 70 percent by 2025. Further, Trump administration officials want China to eliminate requirements that U.S. firms seeking access to its market must enter into agreements to share technology and its restrictions on U.S. corporate investment. They say China has put U.S. corporations at an economic “disadvantage” by stealing intellectual property rights and technological secrets. China disputes these charges and insists it is operating within World Trade Organization guidelines. 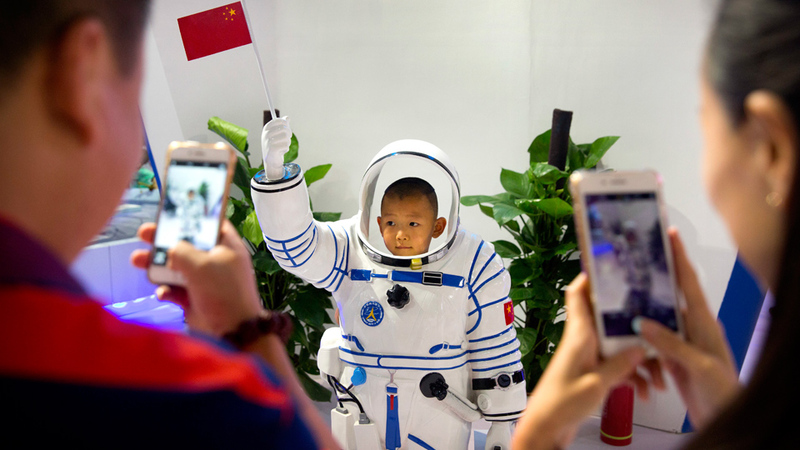 The fact China leads the world in patent applications exposes the racist lie that it doesn’t possess the wherewithal to develop its own intellectual and technological innovation. The chief architect of this policy is White House National Trade Director Peter Navarro, who “took aim at China’s internal plan to develop cutting-edge industries like robotics, new energy vehicles, advanced rail and shipping, and aerospace, saying the country could not be allowed to dominate technologies that will be an important source of jobs and growth for the United States in decades to come,” The New York Times reported. Navarro is considered on the fringe by most economists and advocates some of the most extreme measures against China, which he sees as posing an existential threat to the U.S.
China sees the rise of economic nationalism as a threat to its domestic economy and to global economic development. Despite Trump’s pressure, it has declared it will never agree to abandon its developmental path of creating a “modern, democratic, culturally advanced, harmonious, and sustainable socialism” by 2050. Trump’s “America First” economic nationalism will actually hurt U.S. workers and farmers by closing markets and making goods uncompetitive. It undermines the dominant role of U.S. imperialism and ironically opens the door for China to become the global economic leader. Globalization is a historic process, in the view of Chinese officials, which has unfolded over the past 400 years and is impossible to reverse. The world is becoming more interdependent, including relations between the U.S. and China. Seen in this way, economic nationalism is doomed to fail but will create plenty of damage in the meantime. 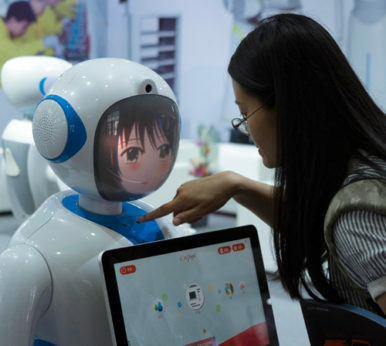 China believes the world is entering a fourth historic stage of globalization characterized by integration of the global maritime economy with the inland economy and powered by the revolution in digital communications and smart technology, especially artificial intelligence. The growing mutual interdependence and regional economic integration of the various Asian countries also characterizes this “new era.” Trade volume among these economies now exceeds the volume of trade externally, accounting for 50 percent of world economic growth. Asia is the most dynamic region for future global economic growth. “Openness brings progress, while self-seclusion leaves one behind. China will not close its door to the world; we will only become more and more open,” declared Xi Jinping in his address to the Communist Party of China’s 19th Congress in October 2017. The economic and social developments in China since the start of socialist market economic reforms in 1978 and “opening up” to the global economy under the leadership of Deng Xiaoping are staggering and unprecedented in human history. President Xi called the achievements, “China’s second revolution,” despite the many problems, contradictions, and setbacks that have come with change. The results of this shift speak for themselves. China has leapt from an underdeveloped economy to one with modern and advanced infrastructure. Within a decade, China will be the world’s largest economy measured by GDP. Seven hundred million people have been lifted from extreme poverty, which will be eliminated completely in the next three to five years. 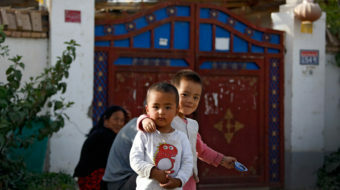 Almost all Chinese will live a “moderately prosperous life” by 2020. Economic growth is nearly 7 percent per year, and China accounts for 30 percent of global economic growth. The country poured more concrete from 2011 to 2013 than the U.S. did in the entire 20th century. The standard of living is also being raised—rapidly. Wages, while still low by U.S. standards, have risen for factory workers by 64 percent since 2011 and are now on par with workers in Portugal and South Africa. Workplace safety has also seen steady improvement. The economic reforms were recognition that the old model, which was largely patterned on the Soviet Union’s centralized economy and characterized by near total public ownership of all sectors, had reached its limits and become a failure. After nearly 30 years of pursuing that strategy, by the end of the 1970s, China was still an underdeveloped economy. The reforms were a shift from a model based on “egalitarianism” to one based on the principle “to each according to their work.” This was done through the introduction of what eventually became known as a socialist market economy. The first reforms were carried out in the agricultural sector with the initiation of the “contract” system, whereby each rural household was responsible for its own plot of land rather than being part of a collectivized communal farm system. Production increased dramatically, and the reforms were extended to the manufacturing and service sectors. Total state ownership of the economy and strict central planning also ended. Today, roughly 60 percent of fixed investment in the Chinese economy is in publicly owned or publicly controlled enterprises that have a minority private stake. The government directs short and long-term strategic social investment and asserts control over armaments, power generation and distribution, oil and petrochemicals, telecommunications, coal, aviation, and shipping. Along with the many achievements, the breakneck pace of development over the past 40 years has also come with costs, though. This included subsuming worker rights to overall development, the growth of the capitalist sector with all its risks, economic inequalities, the emergence of a billionaire class and sharpening class struggle, imbalances between urban and rural economies, and severe environmental problems. Social equality and consciousness have tended to trail behind, far behind in some instances. According to Xi, China is the world’s largest developing country, is still in the primary stage of socialist construction, and “will long remain in the primary stage.” The main contradiction China faces is between its imbalanced growth and the rapidly growing expectations and needs of the people. 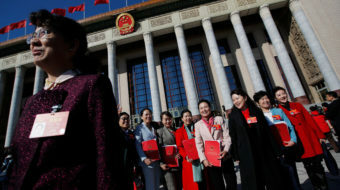 The 19th CPC Congress in October 2017 projected a new round of openness and bold economic, social, and governance reforms that extend decades into the future. The socialist market economy will continue to dominate in the new era. But instead of a model based on the export of consumer products, the goal of “Made in China 2025” is to remake the country into a global high-tech manufacturing power and radically increase productivity through innovation and cutting-edge digital technology, artificial intelligence, and big data. The target is to gear production toward quality over quantity. The newly created industries will be geared first to satisfying the rapidly growing domestic market and then later compete in the global economy. In addition to providing the conditions for private and public enterprises to promote innovation, China is in the midst of a massive modernization of its infrastructure, including creating a world-class system of universities, research institutions, and hospitals with the expectation of attracting world-class scientific talent. Development and sustainability will go hand-in-hand to create an “ecological civilization.” China invested $126 billion in renewables in 2017, a 31 percent increase over 2016, making it the world’s biggest investor in the field. A high-speed rail system extending 35,000 kilometers (nearly 22,000 miles) is half complete. Production of electric vehicles is ramping up. 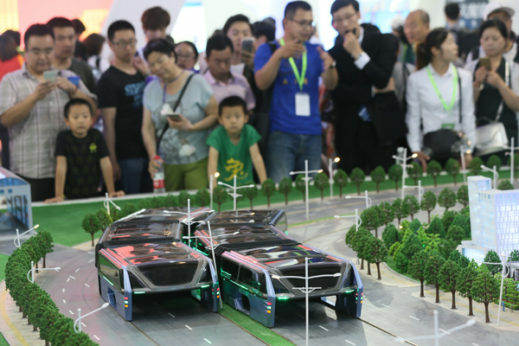 The approach toward promoting innovation as an economic driver is clearest in Shenzhen, site of the first special economic zone that opened to foreign capital. Forty years ago, Shenzhen, in the Pearl River Delta and close to Hong Kong and Macau, was a “sleepy fishing village” of 30,000 people. Today, it is a modern planned bustling eco-metropolis of over 20 million. At one time, Shenzhen was a vast production and manufacturing zone that relied on imported innovation. Today, locally derived innovations typically make up 76 percent of products. “Local firms that used to rely entirely on imported know-how and parts have started to work on their own inventions and methods. Foreign firms that used to come to the delta to harness its brawn are now tapping into its brains as well,” writes The Economist. More international patents are applied for in Shenzhen than France and Britain. In contrast to the secretive corporate culture of Silicon Valley, in Shenzhen, businesses, universities, scientific research and development institutes, and manufacturing facilities all collaborate to significantly streamline the production cycle. One of these “innovation hubs” already in operation in Shenzhen consists of a complex of 19 buildings employing 300,000 workers. The new enterprises range from public to mixed to private ownership and include 69 incubator businesses. Local authorities are encouraging young innovators by providing inexpensive space, free Wi-Fi and other resources. The government’s role will be macroeconomic management, including of public assets; market regulation; delivery of public services including health care, transit, and education; law enforcement; and environmental protection. The special economic zones will continue to experiment with less red tape, and restrictions on investment in the service and financial sectors. China’s domestic economic development is inseparable from its deeper integration in the global economy. By far the most ambitious project is the Belt and Road Initiative (BRI) launched in 2013. It is a massive $1 trillion development project comprising over 2,000 local construction projects and is often referred to as “China’s Marshall Plan.” It is probably the most ambitious infrastructure project in modern history. Once complete, 71 countries in Asia, Africa, and Europe, including some of the poorest in the world, will be linked via six land and sea corridors. These corridors will feature modern infrastructure, rail and road transport, modern ports, electric grids, refining capacity, water sanitation, pipelines, and cultural exchanges. China’s western provinces and the countries involved will experience substantial development. By cutting transportation costs in half, global trade could increase by 12 percent. One other aspect of the BRI is worth noting. China’s economy is dependent on foreign trade, including 90 percent that travels by sea. The BRI is also a strategic plan to bypass any future threat of a U.S. economic blockade, particularly of the Strait of Malacca. To help fund the BRI, China is developing alternative financial institutions parallel with the World Bank and International Monetary Fund. These institutions, including the Asia Infrastructure Investment Bank and the New Development Bank, threaten to upend the international financial order. The ambitious and mind-boggling development plans and the new era of economic reforms mean China will continue to take giant steps toward a modern socialist society and increasingly shape global economic and political developments along the way. Trump and his economic nationalist plans for trade wars and white nationalist immigration policies will also shape global development, though not always as he might intend. His haphazard tariff policies will not only hurt workers in the U.S. and around the world, but also—whether he knows it or not—undermine the dominance of U.S. capitalism in the world economy and global governance. Trump’s policies run counter to the new stage of globalization taking shape and are doomed to failure. There is another option—that of fairly negotiated trade and international cooperation on a range of critical issues facing humanity. So far, this White House is uninterested. 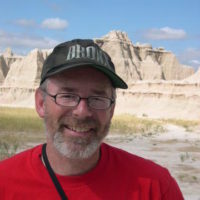 John Bachtell toured China from May 26-June 3.